The room is looking great. Contractors and distributors are not as eager to get everything in place for 25 7 year olds as I am. Today we will be installing the Apple TV into the monitor. This will be conducive to a continual stream of student work, photos, projects, etc. You will also see the plexiglass section which will be a place for students to contribute. 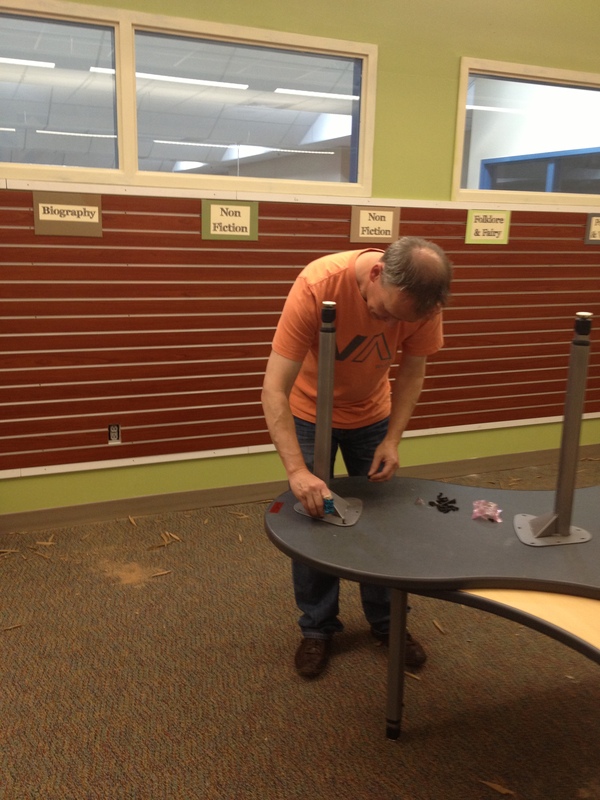 The Genius Bar is looking fun; however, I am hoping that the kids can maneuver the stools! That is where the Dell touch will be housed. My vision is that kids will huddle around it and share their ideas collaboratively. The puzzle tables were a bear to put together (thanks, husband), and I am thrilled at the flexibility of their shape and the ease of movement around the room. 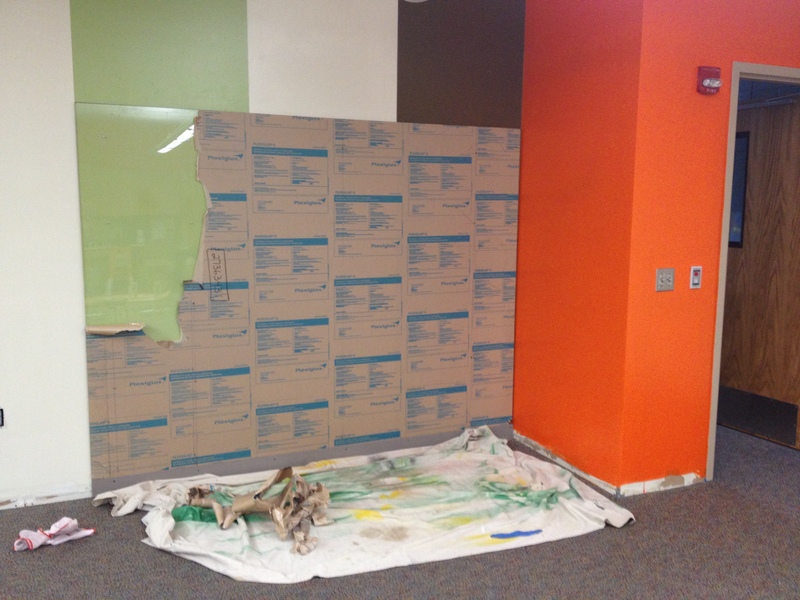 I am thrilled with the slat wall portion of the room where books will be displayed in genre sections. I will have to be on top of my book collection as they ALL will not be out as usual. I am hoping that students will gravitate to a less is more type area, plus they will be reading on their IPADS. 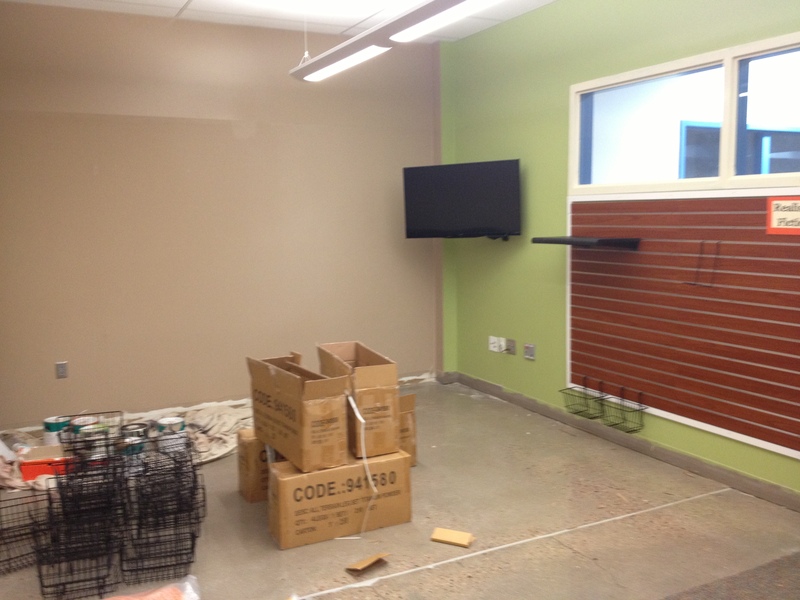 The space next to the TV is the Maker’s Space and shelves will be put on the complete tan wall. 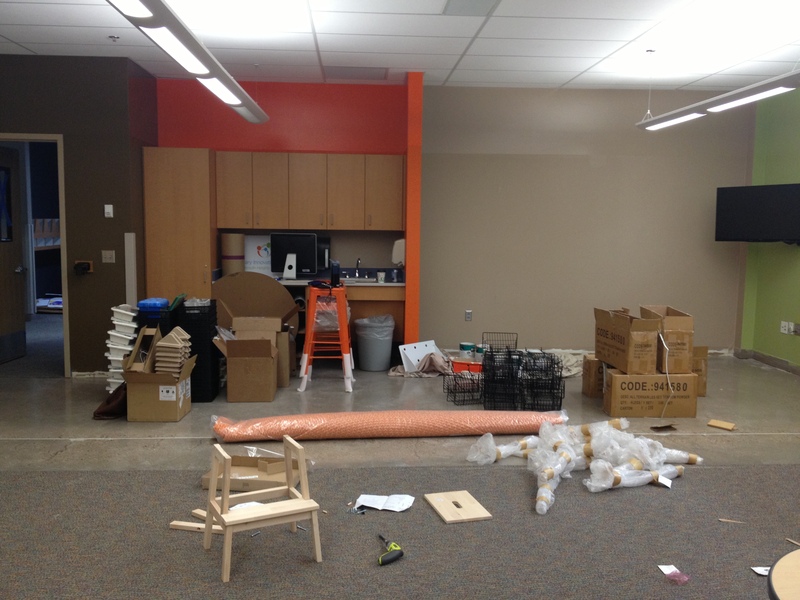 Many supplies have been collected which will make this space full of creative potential. Mentally, I am a bit tired. Studying 21st Century possibilities, cruising the web, pinning on Pinterest, chatting with experts, and studying APPs is like a huge feast. At first you are totally excited but after you eat you might have a bit of indigestion! However, I know that as things continue to fall into place that inner heartbeat of excitement will push me to the next step of the process. What’s wrong with those darn contractors! Don’t they know school starts in a week? The room is looking wonderful and you will still make the classroom a wonderful place in spite of what still needs to be done. 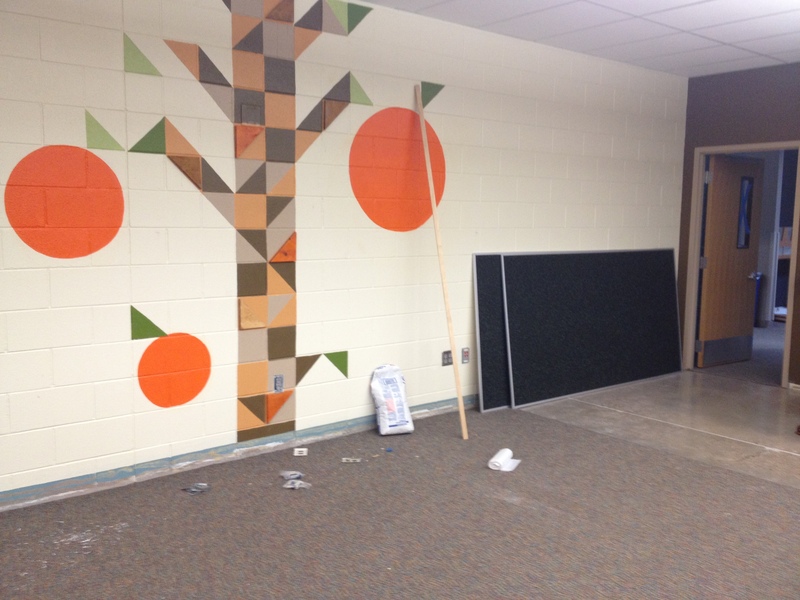 Your students can share in the excitement of having the room finished up! It is frustrating. I was much more “free and flexible” about it a month ago. It will get done, I am continually grateful. Much of it has to do with material shipment. Flexibility is one of my strengths–consciously, thank goodness. Suppose the annoying headache on the right side of my head might be the contrary. Wow, Melissa B. Your comments are so true. I am going to COMMIT to a sound yoga practice and make a no work on Saturday policy. And you are right about the kids coming in and making it all worth while.